Nationals starter Gio Gonzalez, in the shadow of phenom Stephen Strasburg, is putting up a Cy Young-like season in the early going. McGILLIGAN: Despite being less than 50 games into the season, there’s no shortage of craziness, stupidity and life-altering occurrences – here’s to you Baltimore Orioles fans – taking place. After playing like something even the scrap heap wouldn’t want to be associated with in 2011, Dunn has found his stroke again. He was tied for third in homeruns in Major League Baseball with 12 heading into play Tuesday and sixth in RBI. After a disastrous 2011 where he hit fewer homeruns (11) than millions he was paid by the White Sox (12), Dunn’s future was in doubt. Credit him for turning it around and producing a solid stat line so far this season. If you’re talking about a Cy Young candidate on the Washington Nationals, the first name that comes to mind is Stephen Strasburg. The young ace has been nothing short of spectacular for the upstart Nationals. However, Gio Gonzalez has been tremendous in a Washington uniform as well. With a record of 4-1, 1.94 ERA and second in strikeouts in the National League, Gonzalez and Strasburg give the Nationals perhaps the best one-two punch in the league. Much like Gonzalez is excelling in the shadow of Strasburg, Edwin Encarnacion is in a similar albeit different position. Until recently, reigning homerun king and Blue Jays slugger Jose Bautista has struggled to regain his form, however, the team was getting its power hitting from Encarnacion. With 11 homeruns, he’s making people think he’s finally living up to his expectations and helping Jays fan forget about Bautista’s early season swoon. Bryan LaHair is off to a blazing start for the Chicago Cubs, hitting .356 with an OPS of 1.154 while putting up nine doubles, nine dingers and 20 RBI. LIVINGSTONE: I was going to write a separate post on Chicago Cubs Bryan LaHair, but I figure he fits well into one of the big surprises of the season less than 50 games in. 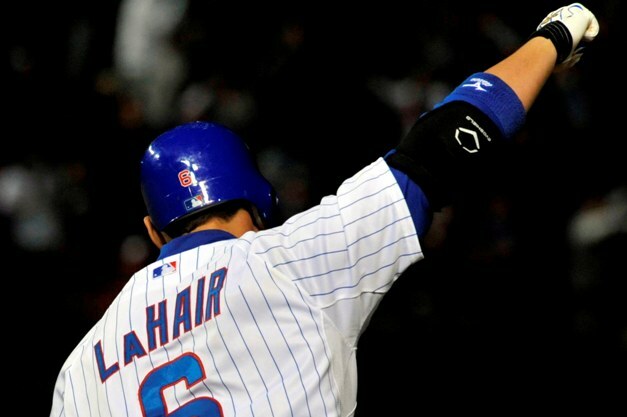 LaHair, who was named the starting first baseman for the Cubbies this year after spending much of the last four years in the minor league system – outside of 45 games with the Mariners in 2008 and 20 with the Cubs last season – wasn’t expected to be the machine he has been to start the year. LaHair has more homeruns (eight) than Albert Pujols and Prince Fielder, combined (Pujols has ONE and Fielder has FIVE). He also makes $483,000 this year – about the same amount that Fielder will get for those five homeruns he’s hit. Combined, the entire Cubs team has 13 homeruns – LaHair’s eight make up more than 50 per cent of the entire team’s round trippers. Drafted in 2002 by the Mariners in the 39th round, LaHair has toiled away in the minor leagues, waiting to get his chance to do what he now currently doing – putting up All-Star-like numbers. What makes it more impressive is the fact a superstar in the making in Anthony Rizzo is waiting in the wings to come up and take first base from him. Being able to produce under that kind of pressure – especially in a city just itching for Rizzo to get called up – is nothing short of remarkable. The way LaHair is playing, and if he keeps it up through the season, it’s going to be tough for the Cubs to move LaHair into the outfield (he can play there, too) to make room for Rizzo. For a team that sits at the bottom of the Central division (as of Tuesday morning the Cubs are in a three-way tie with the Brewers and Pirates for third – and last – with a 15-20 record) and has little to be excited about so far this season, outside of Starlin Castro (.333, 1 HR, 21 RBI) and pitcher Jeff Samardzija (4-1/2.89 ERA), LaHair is putting on a show for a city dying to see its Cubs compete. If he can establish himself as one of the premier first basemen in the National League – or outfielder, depending on what the Cubs do with Rizzo – the Cubs could find themselves in the thick of a wild card race sooner rather than later.